I have loved Murchie's, especially No. 22, since the 90s when we went to Canada at least once a year. Then I went off that flavor. My mother moved here and became frail. 9/11 happened and we didn't go to Canada for several years. We went in 2013 and I bought a medium size Brown Betty teapot and loose tea. I liked No. 22 again. Great, until I ran out. Back to generic Trader Joe teabags or English teabags from the British Pantry in Redmond. I recently found a small glass tea pot that was perfect for just two cups and realized that loose tea tastes so much better. Of course, before I've posted this I broke the glass lid so I am using my Brown Betty for morning tea and you know what? It is just fine for one person. I still had a tea problem. I priced loose tea at the Queen Mary shop, my goodness the prices! I'd always thought ordering from Canada would be expensive. With the current exchange rate it's much cheaper to buy from them and have it shipped than to buy locally. I ordered No. 22, Scottish Breakfast, and Canadian Breakfast. It came in two days, really quickly for crossing borders but not surprising if you think geographically because Vancouver is only 3 hours away. Canadian Breakfast-Ceylon, Keemun with maple flavoring. The aroma is lovely although it does make me hungry for pancakes and bacon! I like No. 22 for breakfast alternating with Scottish Breakfast and Canadian Breakfast for afternoon tea with a lightly sweet something. 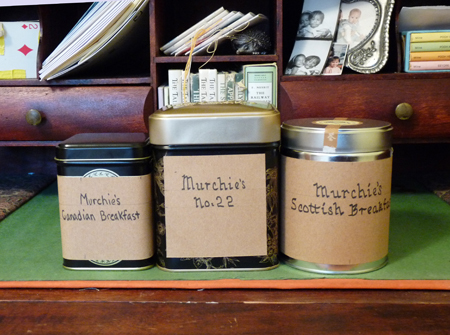 I may be ordering all my tea from Murchie's as long as the exchange rate is favorable. The common thread is Keemun and Ceylon. Next time I think I'll order those as single flavors and see what it is I like about them. I think their Earl Grey is very good and the tea arrives quickly.